Fifteen small yet innovative San Diego defense contractors were chosen Wednesday to participate in a new program to diversify their revenue and strength their businesses. “We need a robust, diverse, technology-enabled supply chain,” said Nikia Clark, vice president for economic development at the San Diego Regional Economic Development Corp. The EDC and San Diego Military Advisory Council are partnering to support the Defense Innovation Voucher program, or DIVx. Clark said 90 percent of San Diego’s military contractors are small businesses whose fortunes wax and wane with fluctuations in defense spending. Yet they have innovative products for which new commercial markets are possible. “That’s our secret sauce — small companies doing world-changing things,” she said. American Lithium Energy, founded in 2006, is a case in point. The Carlsbad-based company makes advanced batteries for use in missiles and other military hardware. The companies chosen from 94 applicants range from makers of specialized instruments and drones to providers of precision engineering, project management and training services. Each will get $15,000 in consulting support and one will receive an additional $25,000. 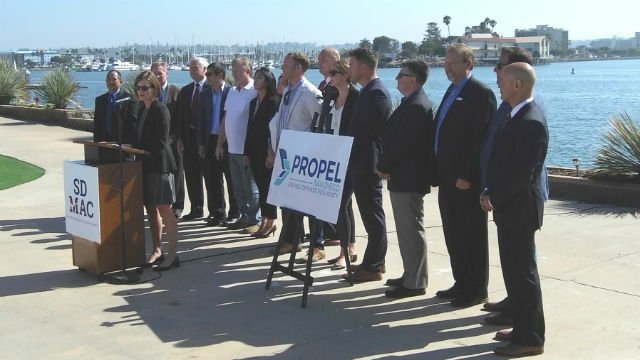 The effort is part of the larger Propel San Diego initiative, which seeks to to create a more robust defense ecosystem in the San Diego region.